Ohrid sits on the shores of Ohrid Lake and is town of vast history and heritage, it was made a UNESCO heritage site in 1980. 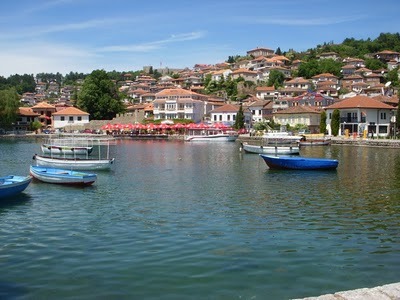 Ohrid is a town of outstanding natural beauty, and is the jewel in Macedonia’s crown. The old city is built on a hill with the Castle of King Samuel on the top. I arrived last Wednesday, at the bus stop there are many people who rent rooms. One Lady offered a room for only 7 Euro a night. The house is outside of the center which is more quite and easy going. I have access to the kitchen and the outside deck, and I am getting some clothes washed. 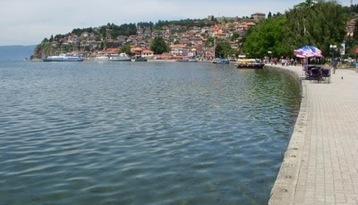 The Castle of Ohrid is in the background. 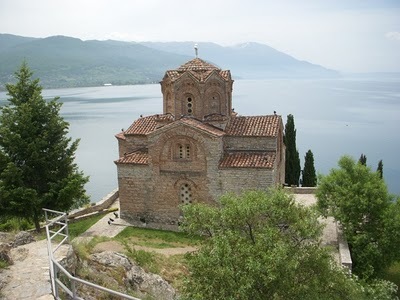 The St.John Kaneo church 13th century – most known for its scenic location, standing on a cliff over Lake Ohrid. 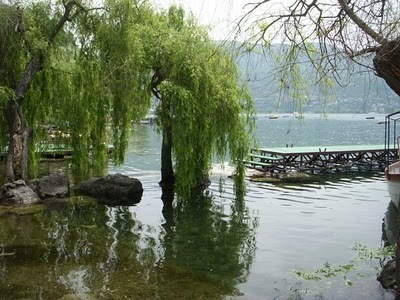 Ohrid is known to have 365 churches in addition to several mosques. Within these ancient churches, basilicas, and monasteries is where Saints Kliment and Naum with the help of king Boris I (students of Cyril and Methodus) wrote their teachings and formulated the Cyrillic alphabet used in the Republic of Macedonia, as well as neighboring countries Bulgaria, Serbia and Montenegro and as far as Russia, and many of the countries of the former Soviet Union. The oldest church is St.Sophia church built in the 11th century. 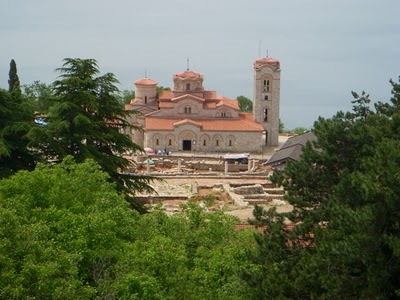 The picture Below is the St.Pantelejmon – Plaoshnik chruch, it has been an important religious center predating Christendom. It is the site of the first university in Europe, opened in the 10th century and it is the place where the cyrillic alphabet was created. The church you see is a reconstruction of the church St.Klement built when he came here and opened the university. The old city center can be noisy and busy, plus it is touristy, but there are many people who rent rooms within their home that are located outside the center. From where I am staying the walk to the beach or center is only one kilometer or a 50 dinar ($1.00) taxi ride. There is a popular walking tour of the old city and I recommend starting at the upper gate as in the LP. Because of the ultra comfort of the home, fast internet, in addition to the relaxed atmosphere of the town I decided to stay 5 or 6 days. 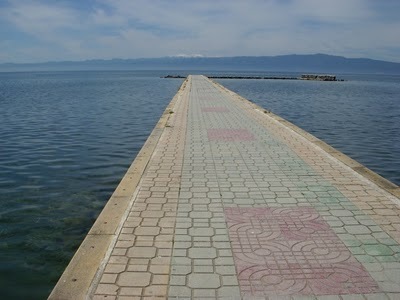 This is the last stop for Macedonia before heading to Albania. 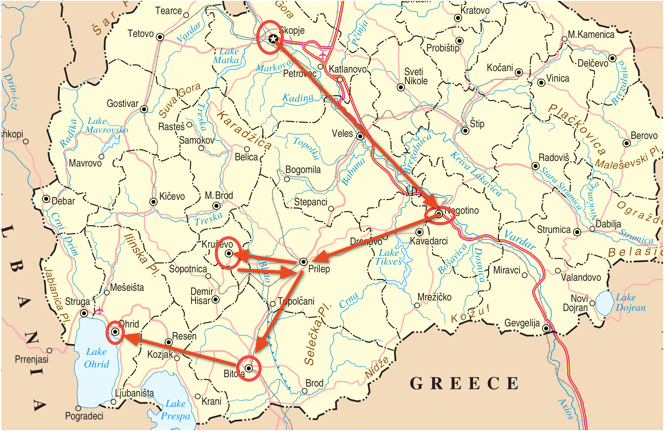 The complete route of Macedonia. Macedonia is a pleasant country to visit that I highly recommend. If you are a budget traveler, the soup is the bomb for only 70 dinar, served with bread and a wonderful garlic sauce. The tap water is fine to drink so no point in buying bottled water. Taxis are cheap but make sure they have a meter. Most hotels are modern and comfortable and for 20 Euro and under it is a great deal. The vegetables and fruits are local and a great deal. Next Post I will be in Albania. You had me at 7 Euro! 🙂 But seriously, Ohrid sounds like an incredible place. My friends family is from there and she went to visit last summer. When she came back she told me that I have to get myself to Macedonia. You say that the old city is a bit touristy, but I bet it isn't half as touristy as we have been lately. We were just talking today about how we have to get ourselves off the beaten path a little bit. I wish we had more time in Europe to make our way there. I would love to visit Macedonia the birthplace of Alexander the Great. The birth place of Alexander the Great is in Pella Greece. The name of Macedonia is the big controversy. Next post: Crossing the Border and Visiting Korca—Albania.